I have done myself no favor in dropping the blogging ball until now. There has been an unbelievable amount of experiences packed in the last 10 days (Don’t worry though, I have 30 pages of notes and a lifetimes worth of memories). One of the reasons why I chose to go on this trip (even though people thought that because of my family’s connections I could do this type of thing later and may have a better use for my senior project): There’s no way you can duplicate this trip. To have 26 people bouncing from place to place, challenging speakers with tough questions, debating topics on the buses and over meals, all while having copious amounts of fun is an incredible feat that we have all agreed is something we are lucky to have been able to participate in. As for the actual content of our days, I don’t know where to start. I could go through summarizing every single chronological thing we have done in the past few days but for the sake of time (We have an early morning of hiking tomorrow), I will just let my thoughts flow and see where it takes us. This conflict is brilliantly, intricately doomed to be a struggle for truth, selfless cooperation, and humanity. Like many systems of corruption in our world, the twisting of the truth is the number one way to keep the public blind to the grim realities of the world. Selective story telling has been the most interesting thing to observe in our discussions. You would like to think that the people who misrepresent the facts are merely doing so due to the fact that they are misinformed as well, and not because they are trying to trick you. We spoke with an Israeli Settler over last weekend and he was purely convinced, or stated quite confidently, that although Israel controls the water supply of the West Bank, they never cut it off because they are “humane”. It is hard not to argue with that until you then go to a home stay in a Palestinian town and they mention that their water is cut off sometimes 2 or 3 times per week. In all likelihood, like most of this, it is all political foolery. For example, the settler mentioned that the Palestinian authority owes over 1 billion shekels to the Israeli government in return for electricity usage. In the moment that sounded quite logically unfair, and it is probably a true figure. The concept that is left out that then within 24 hours we were and have continued to discuss with Palestinians is the undeniable strangle hold that Israel has on the Palestinian economy. If Israel wanted the Palestinians to be able to pay off that 1 billion shekels, they would have the ability to let them. However, in politics, it benefits them two-fold to not allow that. Not only do they get to continue to behind the scenes restrict the economy through obscure law and taxation, but they also get to justify actions by declaring the Palestinians owe them money. The part that many seem to agree on is that the Palestinian Authority (PA) is an under qualified government and is maybe more of a detriment to the Palestinian cause. Settler and Palestinian alike have acknowledged that the PA has misused water supplies and aid money. Just like Israel has affected the Palestinian economy, the best Palestinian resistance has become the BDS movement. The Boycott Divestment Sanction movement which implores people to help take the financial backing away from Israel’s occupation. Things like divesting from the Caterpillar company who makes bulldozers specifically made for the purpose of demolishing Palestinian homes. Unfortunately, there is talk of a 3rd Intifada. If you aren’t familiar, an Intifada is “the shaking off” or the Palestinian uprising with the purpose of violently shaking off the occupation. Today I got into a conversation with a shopkeeper in the Old City of Jerusalem. He was a Palestinian, but when I asked him if he had any necklace pieces that had the Palestinian flag he told me he didn’t but he had plenty of Stars of David and Israeli themed pieces. Interesting how even one so opposed to Israel carried a majority of pro Israel merchandise in order to cater to his projected market. Everyone is just looking for the best way to make and sustain a living. Anyway, I got into a discussion with him about the conflict, and he was vehemently opposed to any political negotiations and believed that a violent uprising was the only way to a result. Unfortunately, I ran out of time as we had to go meet up with the group but I so desperately wanted to tell him how that would arguably be the worst thing for the Palestinians to do to their cause at this point. Israel is panicking in regards to the momentum increase of the BDS movement. It has been suggested that Israel is almost trying to instigate a 3rd Intifada, because they see it as an opportunity to once again frame the Palestinians as the raging terrorists that NEED to be contained. As the popular saying goes, ‘The Palestinians never miss an opportunity to miss an opportunity.” Let’s hope they don’t miss this opportunity to finally turn the tables and bring their just cause to the fore front. One of the sentiments of coexistence that we heard was the idea that, when allowed to return to the former site of their home, a Palestinian will not want to kick the Israelis out of their house and claim it as their own, but rather to build on top of the house and live together. It sounds idealistic, and it is, but hey, acceptance to innovative thinking like that is key to the hope of attaining peace. I hope that you have figured out by now that this blog is far from just a mere recap of what we have been doing on this trip, but rather a commentary on my reactions to just a few things that I have seen and processed so far. I have much more to say, but in the interest of sleep, I will now retire for the night. I will leave you with some pictures that may better summarize some of the tangible events on the trip. 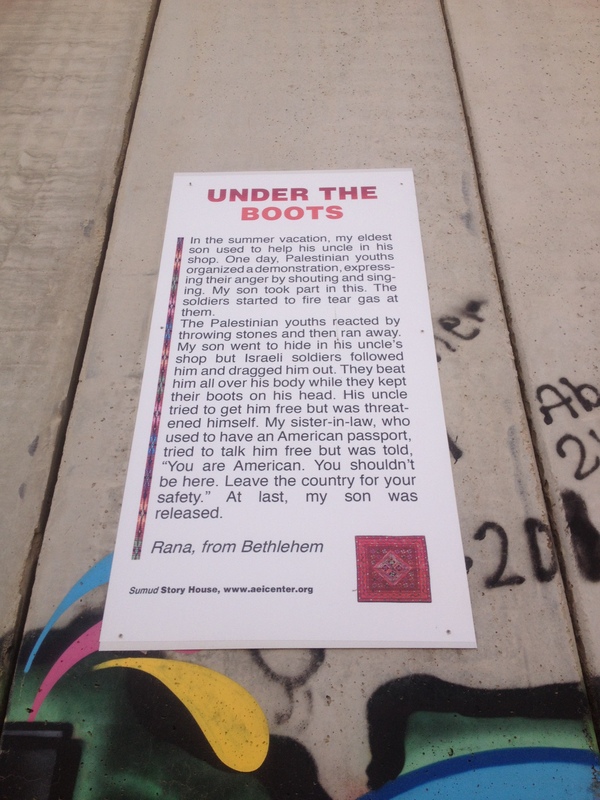 One of the many testimonies on the wall of the effects of the occupation on individuals. Go to the website on the bottom of the wall posting to see more. 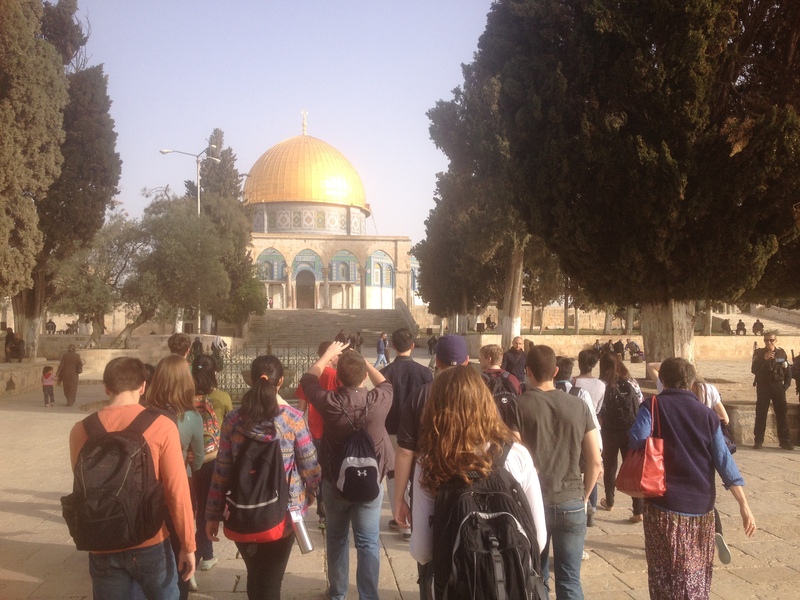 The group after an early morning wake up to get through the security lines to make it up to the Dome of the Rock/Al-Aqsa mosque compound. The 3rd holiest site in Islam. 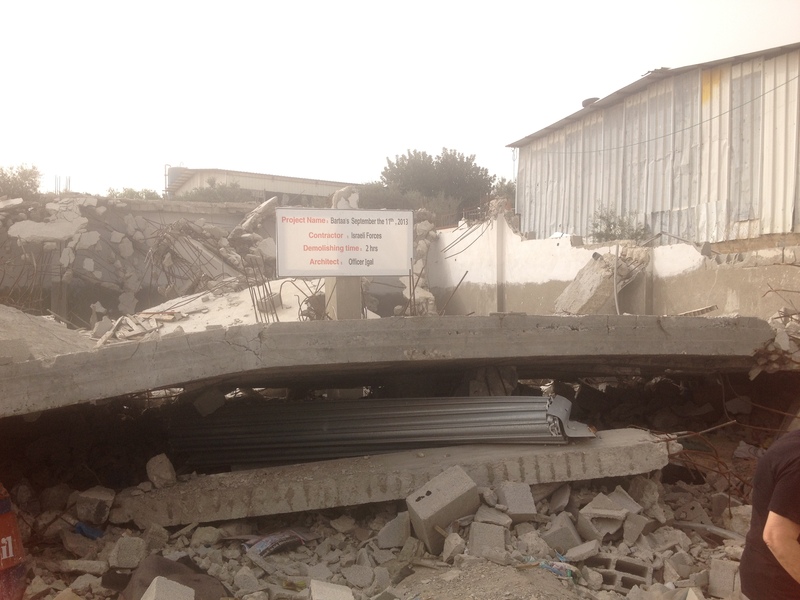 This is the site of a demolition in the Palestinian town of East Barta’a. Although technically on the West Bank side of the 67 cease fire border, nobody in the town of East Barta’a is permitted by Israeli’s to build anything out of any permanent building structures. This business owner defied the occupation and it resulted in this ruble. 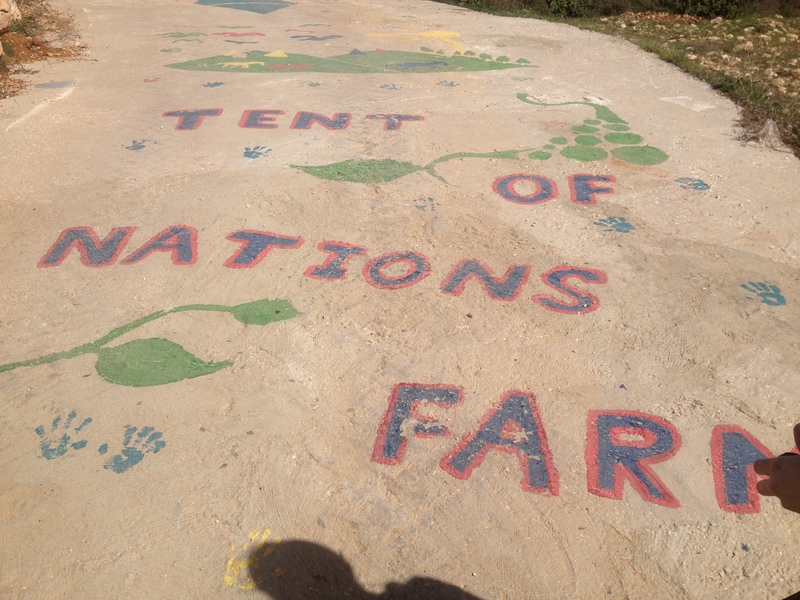 Graffiti on the Wall inside of Eida refugee camp. 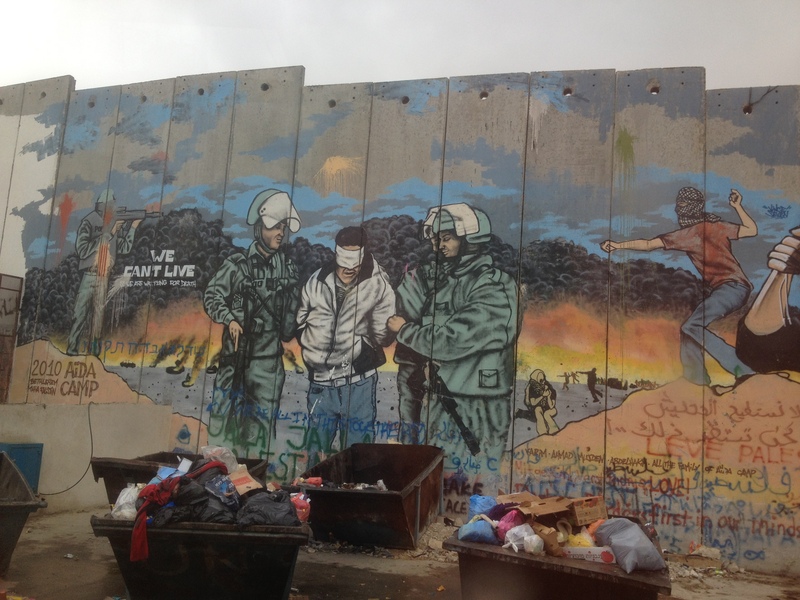 Depicting soldiers leading a blindfolded protester away, and a man throwing a stone at a soldier firing his gun. 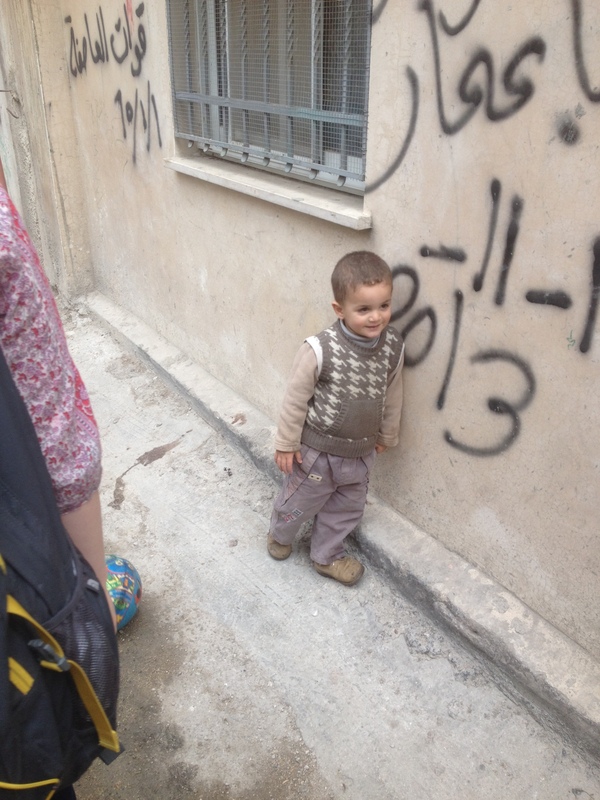 This is a little boy we met passed in the streets of Eida Refugee camp. He was too adorable and welcoming for me not to take a picture of him. Unfortunately the circumstances he lives in aren’t exactly desirable. 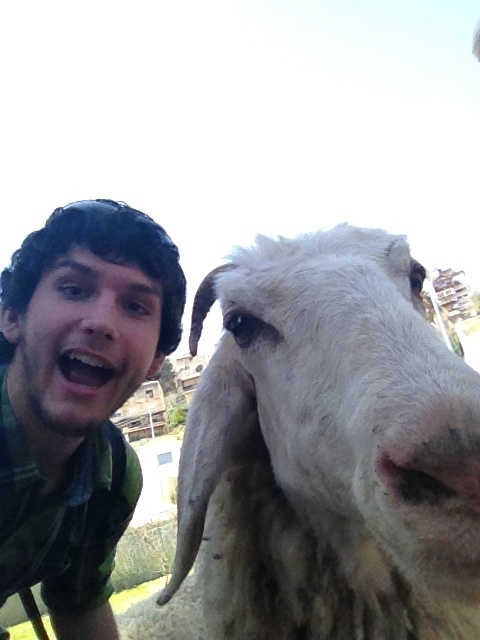 To end on a goofy note, and show that we are indeed having fun, here is a selfie with a goat found in Nazareth in the area that Jesus is believed to have grown up in. Specifically we were touring a small community where a group of residents try and replicate the lifestyle on the land in the time of Jesus.